When John Bandicut sets out across the surface of Triton, he's hardly ready for the storm of chaos that's about to blow through his life. The alien Quarx that soon inhabits his mind is humanity's first contact with an alien life. The Quarx, part of an ancient galactic civilization that manipulates chaos theory to predict catastrophic events, seeks to prevent a cometary collision that could destroy the Earth. But it must have help. If Bandicut chooses to trust the Quarx, he must break all the rules-indeed, sacrifice his life as he knows it-to prevent humanity's greatest cataclysm. I remember reading this book way back in the dark age that was 1995. For my teenage mind, this book was universe expanding. Over the years I have read all the other books in the Chaos Chronicles series, as well as From a Changeling Star and Down the Stream of Stars. But Neptune Crossing? My favorite. Perhaps because it was so formative in my early years about what Science Fiction could be... but no matter the reason, this is a book I always recommend to those who are getting started in Science Fiction, or who need a change from cut-and-paste science fiction stories. 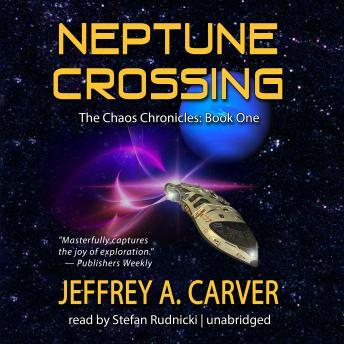 Concerning the audiobook: I believe that Stefan Rudnicki was an excellent pick for this story. His rendering of the characters was very good, if a bit jarring in some instances. What really impressed me was the fact that even though I have read this book several times, I picked up on details that I hadn't ever noticed before. My recommendation for this audiobook will now go hand-in-hand with my recommendation for the print book. Buy it, listen to it, and then listen to it again.